With a Guinness World Record, a black belt in taekwondo, and newly released documentary, Jessica Cox is a person who knows how to get stuff done! Cinema Touching Disability is thrilled that Jessica took a few moments out of her busy schedule to answer a few of our questions. What attracted you initially to taekwondo? How long have you been practicing? When I was 10 years, my mother enrolled me, my older brother Jason, and my younger sister Jackie to a taekwondo class, and I never stopped since. It also helps that my husband, Patrick, is also a taekwondo enthusiast—in fact it was through taekwondo that we met. For a time he was my instructor, and now we practice together regularly. What strategies do you use to use devices such as cell phones or remote controls that are designed to be held in hands and controlled by fingers? I use my toes, in the same way other people use their fingers. To carry things while I’m walking, I lodge the object in between my chin and my shoulder. How young were you when you started learning to do things independently? 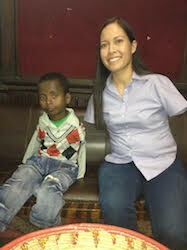 I was born without arms, and so I have never known how to do things differently than using my toes and feet. As early as when I was a baby, my mom helped me develop the dexterity of my feet by giving small toys to pick up with my feet. Were you ever nervous or scared when learning to scuba dive, surf, ride a bicycle, learn taekwondo, or fly? How did you deal with your fear? Flying was my greatest fear and so when I was first approached by a fighter pilot to go up in a single-engine airplane, I was hesitant. But my father was right beside me then and he jumped in and said, “She’d be happy to do it.” And so after that first flight, I knew I wanted to be a pilot and I set out to accomplish that goal. I make sure that my desire is stronger than my fear, and that’s how I can set aside my fear and persevere in the accomplishment of whatever goal I set my heart on. What is the inspiration behind Right Footed? The idea for the film came about around the time that Patrick and I were preparing to get married, and it first started as a love story. The film has then evolved to include disability advocacy and humanitarian trips to the Philippines and Ethiopia. So you can say that the film was inspired by all the disabled people I met on those trips and how I wanted to tell their story along with mine. What would you say to someone feeling isolated because of his or her disability? My advice would to be to start with self-love and self-acceptance. Don’t hide yourself from the world because that will limit the quality of your life. Develop self-confidence in your special abilities because there are things that you can offer the world that other people can’t. Are there any popular images or representations of disability that you find positive and helpful? What about ones that are particularly harmful? I cannot say that I have seen any portrayals that are particularly harmful. One media portrayal that stands out to me as being very empowering is one that recently became popular. It was a series of photos portraying veteran amputees as models. I think it is a very effective way of showing that people like us are attractive and we need not be shy of our bodies, however different our bodies may be from the rest. Have you seen a positive change in the attitude about people with disabilities since you graduated from college? I feel as though there is now more media exposure for people with disabilities. One example is when I saw a veteran amputee dancing on America’s Got Talent. I think it’s very positive sign that people with disabilities are more integrated into mainstream society and are given as many opportunities as everybody else. Did you learn anything new about yourself while making Right Footed? In making Right Footed and seeing how well-received it has been, I learned that I could have a powerful voice in advocacy for people with disabilities. I learned that especially when I lobbied at the Senate for the Disability Treaty. Talk about the positive changes you have seen as a result of your advocacy, travels, and/ or film. I think that because of the film, there is now increased awareness of the oppression that people with disabilities face in other parts of the world. We are very fortunate that here in the United States, there is greater acceptance of, and there are better systems in place for people with disabilities. Such conditions are not present in other parts of the world, and the film was able to shed light on that. I hope that in the future, we can reach out to more and more people who need their voices heard. Catch Right Footed, with Jessica Cox in person, at Cinema Touching Disability, November 6!